A Qmee Review: nice for pocket money but nothing more! 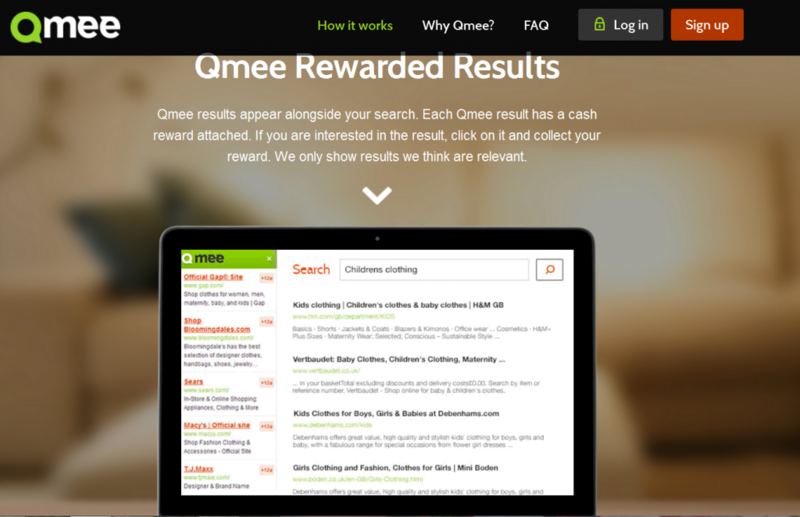 Qmee is a search loyalty program. When you sign up you have to download the free Qmee software. This software can be downloaded to Windows and Mac. When you search online with Google, Yahoo or Bing the Qmee results also appear alongside your normal search results. Each result that comes up in Qmee has a value to it and if you click on their search result you will get paid that amount. These earnings go into your Piggybank. There is no minimum amount threshold for payout. You can get paid out via Paypal or you can donate your earnings to approved charities. Qmee monitors your activity, if it appears you are only searching and clicking to make money your account will be suspended. If your primary motivation for using Qmee is to make money, watch out for this. This is available to anyone residing in the USA and UK but other countries will be added soon. Anyone that is online often and wants to make a bit of pocket money on the side. There is email support available. Can you make money from Qmee? Yes but it won’t be much at all! There are some people that claim they are making nice money from Qmee, but I find this a little hard to believe. Remember that there is a referral option here, so people that claim you can make loads from Qmee are very likely trying to get you to sign up to make some referral income. Well I certainly I wouldn’t give up your day job! This is an honest way to make a little bit of extra cash on the side. You will never make enough from this to support yourself. However you are being paid to do something you already do anyway so I see no harm in it. The best way to earn money from Qmee is to get referrals as well as search using Qmee. Only Cash Surveys Review: What a Waste of Time! After reading your review I think I’ll stay away from Qmee. It’s not that you trashed it or anything I’m just not into these types of things. I’ve read other reviews on different companies that pay you to use their search engines. It’s not a bad idea if you want to earn a little. To me it’s not really worth it since the amount of money you make is so little. Thanks for the info. Robert I am so with you on this one! But for someone looking for a way to earn a few more bucks I suppose it is not bad. I couldn’t be bothered with something like this either! Hi Lynne – Good article on Qmee, I didn’t even know it existed. I’ve actually just signed up, like most people involved in WA i do a lot of searching as part of my research for my website, so as you say I’m doing it anyway. It’s a pleasure Mark. Let me know what you think and if it does anything for you. I am always interested in what others experiences of these opportunities. Great, well done Mark! I would love to get more feedback on how it goes for you. The alarm bells went off as soon as i heard you have to download software to use this earning opportunity – something I would never do! What are the earning options with this type of thing? Is it a high pay rate or is it hard going overall? Do you think you could earn more here than you could with survey sites? Well I don’t think you can earn much with survey sites! This is not a work from home opportunity in my opinion, it is maybe great for some odd pocket money here and there. I am also not fond of downloading any applications and software, so this is not for me personally. I do think if someone wants to earn a little bit of pocket money it is nice, but I don’t waste my time with things like this. It certainly doesn’t appear to be a scam, but not a worthwhile opportunity in my opinion. Good review for the people not wasting their time to make money in the dubious business. After a year of looking for online business I succumbed to the truth that it needs time and talent to see the possible end. As you raised Qmee as a case here I was also pitched into Panel Place where it promised to pay some money for each questionnaire I did. But it seemed like a hoax as when I try to do more it stop sending me the paper with no reason. It was always like this when I started to reach the minimum pay out. Thanks for stopping. Yes I have heard that a lot of the survey companies do that! Either they stop sending surveys just before your reach the pay out amount, or even worse you reach the pay out amount and log in to cash out and they have upped the minimum pay out. Shocking really! 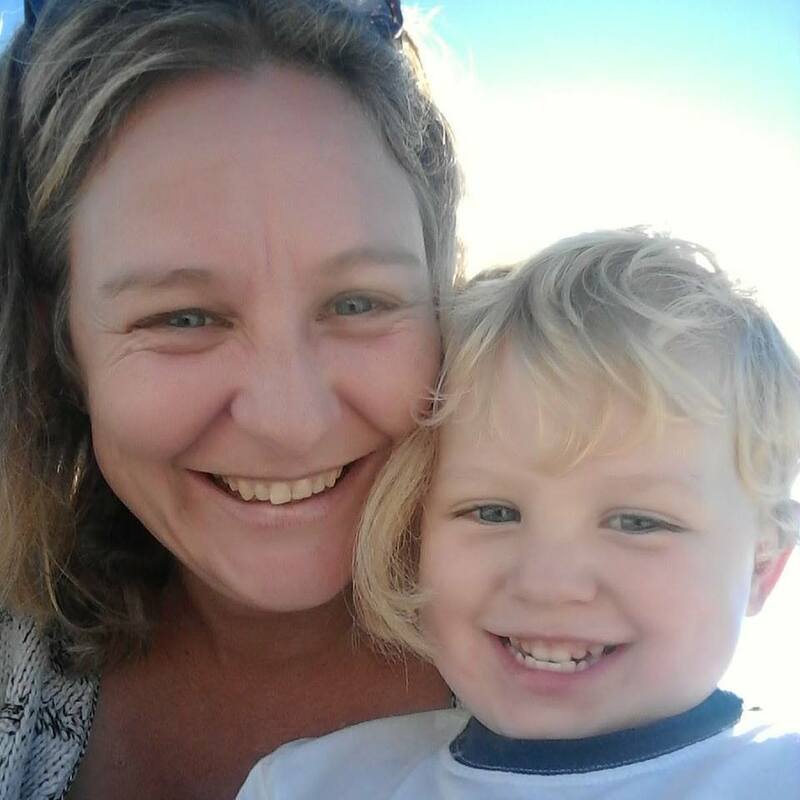 Hi there Lynne, I came across your Qmee review as my partner told me she just signed up (we’re from the uk). She told me you could make money from searching online and I thought it sounded a bit too good to be true. After reading your review though, I see that it is actually possible, but it’s never going to be anything substantial by the sound of it. Can I just ask, do you have any recommendations for a program or training that would allow not just my partner but also myself to create a real business online rather than just a few pennies? Yes you are spot on, I am sure you can make a tiny bit of extra money from Qmee. It appears to be honest and legit but certainly not something you can really make decent money from. The best opportunity I have come across so far is Wealthy Affiliate, check out my review here. It will take hard work, but I believe the sky is the limit once you get going. Just like any other business you would start you will need to invest time and effort into it. The best part it is free, so no need to spend any money to get it going. This seems like an OK way to earn a small amount of money. Maybe a good side gig since it’s something that we already do anyway. I think it’s odd that some searches turn up no results from Qmee. This make it seems like they really monitor the amount of money you can make from this. Although I’m sure it’s better than nothing, it still doesn’t sound that great. Cheers. From what I understand there is nor much money to be made with Qmee, but like you say I suppose you can make a little extra over time. If you do Qmee and a number of other things perhaps it adds up. Hey Lynn, thanks for the honest review on Qmee, I didn’t even know it existed. I’ve signed up to it as my partner is always searching so I thought it would be a great idea just to use it for saving up to give the kids some extra pocket money when we go on holiday each year. Don’t know how much you would make in a year, but like you say,if you’re searching anyway you might as well get paid for it. Thanks for visiting 🙂 I’m glad you enjoyed the review. Please come back and let us know how Qmee works for you. i found your review of Qmee to be interesting. Since one needs to download a software application to use Qmee can this software slow the operation of my PC? It sounds like it is not a scam and those that participate can make a small amount of money for the searches they do on a daily basis. It also seems like a way to find potential clients that might want to join Wealthy Affiliate. Since if they join Qmee to make a little money some of those people might be interested in the free version of Wealthy Affiliate. I am not sure if it slows down your pc or not. It doesn’t appear to. I am not fond of downloading applications though. Yes I am sure anyone that is interested in Qmee would love Wealthy Affiliate, although Wealthy Affiliate will take a lot more work than Qmee. The earning potential is unlimited with Wealthy Affiliate if you are wiling to put the time and effort in. Thanks for your feedback Charles! Ive seen a few of these sites, and while they might bring a bit of extra cash they aren’t my thing…I sign up, all eager and ready to make money…and then forget or get halfway through and realise I haven’t clicked some button…too much lol. If someone was keen and organised I guess they could do ok.
Great review…would be interested to know if anyone’s using it and doing well? Doing well with a rewards program? Pocket money maybe but not making a living. I have also done the surveys thing, you can read my reviews on the ones I have tried… from one legit one which pays peanuts, to complete time wasters and scams. I won’t be trying out any more survey companies unless it is purely for the sake of a review. Thanks for the review! I never knew things like existed until now. I’m curious how you came by qmee? I regularly search and try find ways to make money online and I try and review whatever I find.I can’t remember exactly how I cam across them but it was most likely in one of my searches. Thanks for sharing this product. It seems like a total waste of time & energy. it reminds me of those get paid to take survey jobs so I will definitely stay away from this. I think being a wealthy affiliate member is the way to go for those that are serious about making legit money online. I think the same way, and I have tried loads of survey companies. In my personal opinion it is a waste of time. The amount of effort that one must put in, in relation to what you get paid? Not for me! First of all, thumbs up for your website. It is very pretty with a nice theme, with ease of browsing. I think your review was very honest and to the point! Qmee is definitely just to get some extra money on the side. Unfortunately for me, my country is not included. I would have liked to check out your other website too! Thanks for your feedback, my thoughts exactly on Qmee. I see , too bad my country is not included inside.I believe these people complaining with no results for weeks.All these similar websites (surveys , ads) are not always active.We have to sign up with hundreds in order to gain some Real profit. As you said , some extra cash , but for some countries these earning of 0.001 or so are not worth our valuable time. It is a pleasure, thanks for visiting. Yes I think Qmee is legitimate, but if you want to make money it won’t really help much in my opinion! The problem is that you may sign up for hundreds but how much will you even make then? I doubt you would make anything close to if you just had a normal full time job. You will probably have to also spend a lot more time and effort than you would at a normal job and you will be doing mindless activities too. Not exactly rewarding in any way! Never heard of this and I think this is is awesome in some ways. Though I still question how to use it because sometimes I go form clicking on one thing to the next. So I’m not sure if I should use it. But overall great review and thanks for the information. Doesn’t seem like my area. Just not enough pay-out and kinda seems pointless to use as I am sure most people would just use it to make money. What is Qmee’s purpose if there going to suspend accounts for people trying to make money? Don’t know that I’ll be signing up for this anytime soon, thank you for your review on it. That was my thought exactly. How can you make money from Qmee if they suspend you from using it too much! It is a loyalty program and apparently not marketed as a make money opportunity though. I have seen many loyalty programs like this online, and I think Swagbucks was the first one I come across. Thanks for your verdict and advice too. Just out of interest, would you recommend Qmee or Swagbucks? It is a pleasure. I honestly can’t compare Qmee and Swagbucks because I have not yet tried Swagbucks. I have heard it is very good and I really want to try it out to review it so come back soon! I have personally never heard of this program until now. It seems pretty simple and an easy money maker. The one thing Im concerned about if at what point does the program assume you are just “clicking to make money”? What If I had a decent bank built up and clicked on one site too many? Would I lose everything I earned? With that being said I probably wont bother to download it. I would see a dollar sign and be too tempted. The whole point of Qmee is not to use it to make money, rather to just search normally and get rewarded for clicking on the Qmee results. I do think though that a lot of people probably abuse this and try use it as a money making opportunity. However you won’t make much even if you do find the secret mix between clicking just enough to make some money and not too much that you don’t get banned. I would think that if you get banned you would not be paid out? I am not 100% sure of that, sorry! well this looks disappointing! I mean it is in theory a good idea but in practice it does not seem like it would a way to actually make money. It seems that one can make some little amount if one is very patient and spends a lot of time searching online. But then it also seems like Qmee cuts you off pretty easily. As you said, I would certainly not give up my day job for this! I think each opportunity has its appeal to different people, so sure some people love Qmee and find it great. Me on the other hand, well I am looking for a small online business opportunity not a way to buy a Coke on the weekend. I have very high goals and it seems you do too. People like students might love Qmee, plenty of time online, plenty of spare time and of course they want some pocket money. I don’t have any spare time. With a retail and wholesale baby store, 4 websites, 2 children, a husband and a household to run I personally can’t think of a worse way to spend my time! Instead of cutting lawns could this be the new way for kids to make some spending money…lol. Thanks for the review…doesn’t sound like it is worth the time/effort. Yes well said, it seems Qmee is suitable for teenagers. Not for adults that have children to support! First, I love your website, it’s laid out in a manner that makes it easy to navigate, and the content is clear and concise. Second, I have tried Coffee shop Millionaires, and although you say it isn’t a scam, I found them hard to work with, and a bit pushy on the add ons, I do not recommend, WA is the way to go. Thanks for visiting and for your feedback. I would Coffee Shop Millionaire is a borderline scam. It is dubious and not something I want to do, but I don’t believe it is a downright scam. There is some element of trying to be an online money making opportunity, however it appears they failed miserably at this! Thank you for this unbiased review of Qmee. I never knew this existed. I think I will give it a go as I really spend much time researching. I think I ‘ll just click and see how much I will reach in one year. It is a pleasure and please come back and share with us what your experience is with Qmee. As I can see from your review Qmee is a legit opportunity to make some extra income online and it’s very similar to Swaugbucks. I think it’s a great and easy way to make some cash without spending much effort. It’s a great way for someone who doesn’t want to build an online business and turn it into a full time online business. Have you used it to make any income? And can the program you recommend at the of your review help me build a full time online business and how long does it take to see the results from my online efforts? Yes Qmee is legitimate but I have not done anything more than play around on it for a few days to check it out for the sake of reviewing it. It is not worth my time to try and earn the small amount of money on there. Wealthy Affiliate is a great online business opportunity, you won’t earn money immediately, and you will have to work hard but the benefits of residual income and massive! What I don’t understand however, is what their motive is. Is their any other software involved? Or are they getting paid by advertisers ? It is hardly an online business opportunity, more like something to earn pocket money. I was thrilled when I heard about Qmee first, but now I am kind of disappointed. First it is only available in the USA and UK, second you don’t really get much money out of it. Especially when there aren’t many search results from Qmee. Interesting, but all in all not the right thing for me, I guess. Thanks for sharing your experience with Qmee. I totally agree with you, yes it is suitable for some people but in my eyes a disappointment! Thanks for the great information. I’ve never heard of this program, but might check it out anyway. After all, since i’m constantly doing online searches for my Wealthy Affiliate business why not? Do you know if the Qmee program works on smart phones? the laptop I use belongs to my ‘work’ company and they frown on software being added. I look forward to any more information you might have on the program. Good luck with your Wealthy Affiliate business. It is a pleasure. Qmee currently does not work on phones, but they are busy with this so I am sure very soon you will be able to. I’ve been researching Qmee a lot and landed on your site to check it out. I’ve got a european friend who’s interested in partnering with me to start making money online. We were pretty disappointed that its only avilable in the UK and USA. Do you think they will be bringing it to other countries? We spend a lot of time in western europe. Thanks for visiting, Qmee apparently be available for other countries. Click here to enter your email address and they will email you when they are available in your country. I hope you come right with them soon! Hey Lynne I really like the honest and coherent posts on your site! You’ll be pleased to know that you have actually taught me a thing or two. I have a question though, have you been able to do some of the things you have wanted to since starting your online business?? I am so glad you have enjoyed my posts and reviews. I am glad you have managed to learn something too. Yes I have achieved a lot of things since starting my online business, you don’t ask specifically what I have achieved. I could write a book here! Feel free to elaborate and I will let you know. Great review! It seems that Qmee is an easy way to earn extra money. However the effort that you are putting into it is not paying you big enough. Aside from that downloading a software to use is kinda so much to do. That’s my opinion though. It may not be a scam but extra money is hard to get from it. Do you have any recommendation because i still want to join a more worthy online business? Like I said in my review Qmee is not going to really make you much money. I also don’t like downloading any software. Yes if you want to make some money have a look at my #1 Recommendation. Lynn – thanks for the write up on Qmee. I hadn’t heard of them before but I intend to check them out. It is an interesting concept. It seems like there platform sits on top of traditional search and their model is similar to ad words. Seems like they have an up hill battle going up against google for advertisers but if they can convert better maybe it’ll work. Yes please check out Qmee and let us know how it works for you, I would love to get some more feedback on it. Yes they are small and it is a lovely concept. It would be great if the earning potential was a bit higher! If you find Qmee interesting you might also enjoy Swagbucks, they are also very popular and legit. Your Qmee review was very well done. No one likes to be taken in by a scam like this. It seems very ambiguous to be told “here this is how you make money, just click this” only to find out later that you’ve clicked too much (being to ambitious is bad) you are reprimanded severely with a suspension. Right then and there I was put off by this program. Yes it is a bit of a let down isn’t it? Although Qmee is an ok program to try I don’t see the point in putting any effort into something that isn’t going to make me any decent income. The fact also that you have to download software is not appealing at all. Hi, I think its a good idea but as you said I wouldn’t expect large payouts but I would probably just use it occasionally and then claim it once or twice a year if that’s possible? Unfortunately its not available in my country (New Zealand). We miss out on so much of this type of stuff…. but thanks for the review! Like you said, if you don’t have high expectations you can’t be disappointed! It is a nice idea and it certainly is honest and legit but it just falls short when you look at the earning potential. Perhaps if you find a good number of opportunities that are low earning potential and use them all together it could make a difference? This is the first time I am hearing about this, but it sounds really intriguing and I will be heading over to give it a once over. I love finding new ways to make money online. I am curious why 50 out of 100 as the overall rank? Is it because this is not a ‘big’ money maker? If I am understanding correctly this seems like an excellent opportunity to earn a small bit of extra money for basically living your life as usual. Spot on, I only rate things very highly if you can make a decent amount of money, if it is ethical and legit. This opportunity fell very short making decent money and that is why I rated it how I did. Yes Qmee can be a nice way to try and make money but I don’t think it would make a big difference to your financial situation. Great job on reviewing Qmee search review. I’ve always wondered if it was worth it to sign up for these sites that pay you for searching. I like how you inform us all not to give up our day jobs. Its pocket change at best. And hey if you are searching, it might not be bad to get paid for it. It essentially is found money. Yes it is a nice way to perhaps supplement your income, but I would advise adding in a few more ways to supplement your income if you want to try Qmee. It won’t make any difference on its own. Like you say you are being paid to do something you will be doing anyway so I can’t see the harm in it and it is not like you are doing anything extra to earn some money. Thank you for an honest review on Qmee. I do not think Qmee would be for me especially since I did try Inbox Dollars at one time and had a similar experience in their hardly every being results to click on to even make a penny or two. I’m curious, does each result pay the same or different amounts? With Qmee each result has a different value if you click on it, these amounts are shown in the search results for each one. I haven’t tried Inbox Dollars before, thanks for sharing about your experience with them. I appreciate the review. I myself have no interest whatsoever, in making a few cents on the side that never really amount to anything. I am a college student online, so I am always on the internet searching for A,B or C, all day somedays. However, just to sign up and then see a five cent worth, would probably just frustrate me. I think this is for older people who really don’t get out that much. I could see how someone who does not really do too much, coupon clippers, or some of those types could be interested in this. However, I just am not that interested in 5 cents, I try to invest my time into bigger money ventures. To be honest i never even knew that a platform like that existed. I wonder what the catch is, because as you know, their always is one. I think I’m fine with just google knowing all the things I look at and search any given day. I would choose not to include anyone else. Perhaps you are right, maybe it is more suitable for someone that is retired and interested in collecting coupons? All I know is that I agree with you totally, I am also not interested in something that will only earn me a few cents! I am also interested in bigger ventures, an online business opportunity and that is what I base my reviews on. Thanks for your feedback, if you decide to try out Qmee please let us know how it works for you. I would also love to know what online survey companies you use. I have tried many and my personal experience is that you can’t make any decent money from taking online surveys. The thing about honest reviews is that you simply can trust the product. Most businesses sell us the million dollar dream, and we get nothing out of it but a dream. Personally I am tired of dreaming, and here on your review I am suitable to know what I would be getting into if I didn’t want to dream with qmee. I love that you state that “if one is looking to make a living doing this, it is not for you”. On the other hand, if one is constantly on the web, doing things in relation to this opportunity, why not make some “change” doing it. Also, thanks for the heads up you give for those who want to just “click away”; how they would get suspended off the site. Thanks for the info indeed. Great review. Thanks for your feedback. Yes every legitimate opportunity is not suitable for everyone! 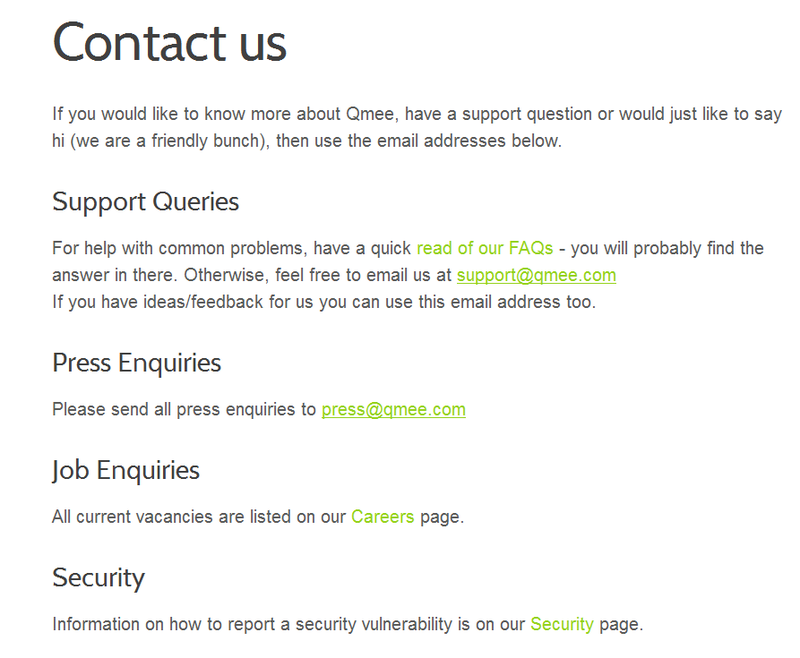 There are loads of people that love Qmee but for me personally it does absolutely nothing…. I am after something bigger. your overall rating i am afraid is where i stop my research for this product, so thank you for informing me. Hi Jack. I am glad you enjoyed my Qmee review. I think with Qmee you will either love it or hate it! That’s actually pretty interesting. I am online a LOT – at least 4 hours a day doing searches for my website, so this is definitely something to look into. When you say you earn very little, is it at least enough to make it worthwhile? How much is a little? Hi Donna, that really is hard to say. Each search result will have its own monetary value. Usually around $0.01 or $0.02. However sometimes there are no Qmee results, sometimes there are. So in this way it is too hard to say what you can earn. Also as mentioned in the post just be careful of clicking too much on Qmee results because it is a search loyalty program, not intended as a way to earn money clicking as much as possible. They will ban your account if you click too much. Give it a go though and let us know how it works for you, I would love some more feedback and personal experiences to share with my readers. Great review! I had never heard of Qmee, but I use Bing search and have accumulated points for Starbucks cards and other things. I don’t like the idea of downloading yet another program in order to use it, so I’m glad I read this to let me know that’s the case. Thanks for the info! Hi Shannon, glad to be able to share this with you! I also don’t like downloading any software so this makes it very unappealing for me personally. So I can earn from qmee by just using their software? That’s great to hear. But as what you have said, i can earn just less than 1$ right? I think this is too small if I really want to earn some extra cash. Do you still recommend it even though the pay is low? Do you have any other alternatives? Hi John. No I don’t recommend this as something you can really earn from. If you use it as it is supposed to be used, purely as a search loyalty program and only use it for when you would normally search then I would say give it a go. But no, you will never earn much from this. Regarding recommendations it really is tough. It depends on what you are looking for. If you are like me (and it sounds like you are) then I would recommend you go into affiliate marketing. Why work for someone else for peanuts when you can earn lots of money in your own business. If you don’t want to put the time and effort into starting your own business maybe try Opinion Outpost for online surveys or User Testing to earn money testing websites. Swagbucks is another loyalty program which is quite good. I have never heard of this qmee and reading over your cons of little pay and sometimes not being able to do anything for weeks, seems like a downer to me. Sure there is no cost involved but to make pennies is not for me. So I think I will pass on looking into this program. Your alternative (wealthy affiliate) for this certain is a truly the way to go. I found out that to gain success you do have to work for it. Hi Angela, yes if you want to make some decent money this won’t be for you! I’ve found that lots of people enjoy Qmee and another loyalty program Swagbucks, but I just can’t figure out why considering the small earning potential. I would say then that yes, Wealthy Affiliate would be much better suited to you. It looks like Qmee is a legit opportunity and finally someone can make some money with it. For some people that are looking for an opportunity to make extra cash online this may be appealing but probably not for me. I prefer affiliate marketing over any other opportunity because it works for thousands of people and it works for me too. Why make pennies instead of dollars? Anyway, Qmee is a good option to make some extra cash in addition to your main online income and I think I will try it. Well said Rufat and my sentiments exactly! Thanks for visiting and sharing your opinion. I was always wondering if there are real oportunities for people to make a lot of money online, the Qmee doesnt really look like one, lol. I am curious, what in particular made you want to do all the research for the different type of small busienss opportunites out there? and by the way wow that is a very detailed look over the software, i dont think you can research anything else, thank you. I love doing this, I love working online and I got really frustrated trying to find a way to make money online and to find ways to learn the right way to do things. I have come across a few really great opportunities but unfortunately the majority of thing I came across were scams and time wasters. I’ve now become quite good at spotting scams and seeing through all the fake promises. My goal of this website (along with make money of course, I won’t lie here!) is to help people choose the best opportunity to make money online without having to waste money or time. I’ve heard of these types of things where you can get paid to click on search results. It sounds like they are legit and I like that there is no minimum payment threshold. That said I agree with you, you won’t make much of anything out of it. My biggest argument with these things including paid surveys etc is the amount of time you spend clicking, watching and reading stuff you would be much better off putting that time into building a real online business, with much better long-term returns. I’m glad you enjoyed my review of Qmee. Yes I also much prefer spending time and effort building my online business. Thank you for the review about Qmee. You said that it’s not available outside of the UK and USA so I can’t try it because I’m living in Finland. That’s the problem with some of these earn money online programs like Swagbucks also. I would be interested in to try some of these but then they are not available in Finland. But the good thing is that there are still A LOT OF opportunities available 🙂 and I will concentrate on them. It seems that Qmee and other similar programs can give little extra income but probably not too much. I’m still curious because I would like to earn full-time income online so I want to be aware about different opportunities. If the reward is now worthwhile in some programs, I will stop doing it and concentrate my time and effort on something more rewarding. Yes I agree with you, I also find it hard being in South Africa. Most of these types of online opportunities are targeted at US and UK so if you are outside of those 2 countries you will probably struggle to find lots of surveys and loyalty programs. That said, these opportunities really don’t amount to much anyway! I recommend the following (in order of preference): Wealthy Affiliate University, The Chris Farrell Membership, Affilorama, Bring The Fresh and Shopify. All of these are to start your own online business. I have used Qmee in the past. It isn’t bad and still allows me to use my preferred search engine. They pay decently as well. I think people can find some use out of it if they need some spare change. All you must do is spend a few seconds to make a few cents. Technically, you’ll be working for $40 an hour, but the links are too sparse to amount to anything near that. Yes I think if it is used in the right way, with realistic expectations then Qmee can be nice. I’m happy to help. If you do loads of searches you really can’t got wrong, you’ll be earning for something you do anyway! Do you know of any online work available to Soth Africans – majority are either for the States or U.K.residents. I’m looking for something authentic so as to make enough to be able to afford WA as a premium member. Well nothing online will really pay you enough to cover your entire WA fees. You can try Answered Insight they are a legitimate online survey company but the pay per survey is low and you can’t control how many surveys you get or qualify for but it does add up over time. Then you can try Clixsense. I have actually found them to be quite a nice little side earner but once again it won’t cover your entire fees at Wealthy Affiliate. Ron how long have you been a Premium member at Wealthy Affiliate? If you have been Premium for 3 months the easiest way to cover your fees by working online is to actually publish training at Wealthy Affiliate! I easily cover my fees each month by doing that. Or well I was doing that for a while but I am too busy with my own websites now. You earn $5 each time your training is viewed, liked and commented on a certain number of times. So you can actually start earning a nice residual income by publishing training at Wealthy Affiliate. The only thing is you need to be Premium for 3 months before you are able to publish training!